The UK based company Digital Yacht will introduce a new range of Class B+ AIS transponders at METS 2018. Class B+ is a new AIS standard. This is performance similar to Class A transponder but for non mandated users. This new standard is ideal for ocean sailors requiring the best possible performance and future proof satellite tracking applications, fast power boats and smaller non-mandated commercial vessels. It still inter-operates with existing Class A and Class B systems. There are two models. The AIT2500 is priced at £575/€745 and the AIT5000 at £875/€1050, which has a patented ZeroLoss VHF-AIS antenna splitter allowing the main VHF antenna to be shared with VHF and AIS. Russ November 13th, 2018| No comments - be the first!|Tags: AIS. Almost every cruising boater knows about AIS – the Automatic Identification System. Released in the last 10 years, AIS-A became standard on large ships. Today it is a required piece of equipment on most large commercial vessels. However, AIS-A was fairly expensive and complex, so few recreational boats installed it. AIS works through VHF radio. Packets of data are sent out providing live navigation data – position, speed, course, heading – along with other very useful information – vessel name, vessel dimensions, MMSI, age of data, etc. Early devices for cruising boats were only receivers. They'd allow your chartplotter or PC navigation software to view the position of ships broadcasting AIS packets. For offshore, busy harbors, or twisty rivers, it gave a view of the ships that were coming in many cases when radar didn't give enough information. It also provided automatic collision detection and warnings. 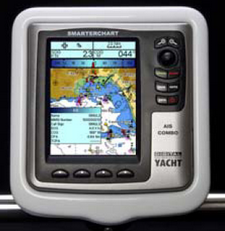 In 2007 AIS-B was released with a lower-cost set of specifications to work alongside AIS-A. Still, early AIS-B transponders were over $1,000. A transponder not only receives all AIS traffic for display but also sends out information about your boat for others with AIS including ships. Over time transponder prices dropped and capabilities increased to the point where today you can purchase a full AIS-B transponder for far less. 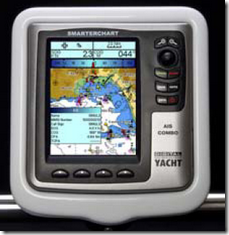 Between these new prices, the ease of integration, and the support of AIS in almost every chartplotter and navigation software, we think that if you don't have an AIS transponder, now is the time to get one. We've had AIS integrated into our electronics since February. It didn't take long before we saw how useful it was. AIS targets show a ship's or boat's name. That is very useful when you want to communicate with them especially at night. When a boat is coming from behind, the AIS target and track line generally gets our attention. Our 7.5 kt speed means we're passed a lot. It's very nice to see the speed and closest approach calculation as a faster boat is approaching. In a specific situation involving a barge, an American Cruise Lines ship, and narrow cuts, we were able to see them miles in advance on the ICW. This allowed us to hail them by name and arrange for a safe passing location. Time to closest point of approach is one of the standard AIS displays presented allowing you to see approximately how long it will be before you meet oncoming traffic. Finding friends nearby by seeing their boat name is a great social tool. It's also nice to see the names of boats you're traveling with on your display. Transmission of a ship's MMSI allows for VHF DSC radio calls to boats that are unknown to you. This is quite valuable for offshore communication with ships especially at night. 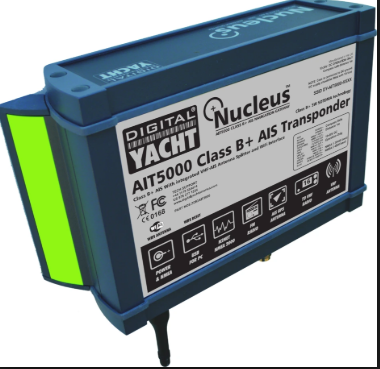 When looking for an AIS-B transponder, make sure it has an integrated GPS, has low power requirements (2-5 watts), and has connectivity to the displays you need. Typical devices will have NMEA 183, NMEA 2000, or USB. A device that has all will provide the greatest use no matter what other navigation products you use now or might switch to later. If you're using PC navigation software, a USB capability is very nice since no adapters will be needed – just plug the USB cable into the PC. There are some AIS devices with WiFi. 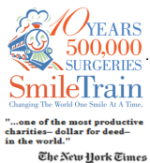 We think these devices are too limited and create difficult situations. They limit connectivity to a single display and often make it difficult to use other WiFi systems in your boat at the same time. There are better ways to integrate NMEA 2000 with WiFi that we'll write about in another newsletter. Suffice it to say, NMEA 2000 on any AIS device you purchase should be a requirement because it'll give you many future options. If you don't currently have an AIS transponder, you've probably been thinking about getting one. It's time. Get it now and use it over this next cruising season. You'll love it and wonder how you got along without it. The transponder needs a VHF antenna. There are two ways to install this. 2) use a VHF splitter which will allow you to share an existing VHF antenna with the AIS radio. A good splitter will cost a couple of hundred dollars and requires power but often makes the installation simpler. The decision for a splitter isn't simple – you probably have multiple VHF antennas already. If you don't, consider an inexpensive VHF whip antenna. We used a splitter with our secondary flybridge VHF antenna. The transponder is supposed to have its own GPS. For maximum quality of signal, make sure the AIS unit is placed in a location that will have a good, reliable signal. If you must buy an AIS with an integrated GPS, make sure to get an external antenna for the GPS part and put that antenna someplace higher. The GPS for our AIS is in our pilothouse ceiling with fiberglass above it. We do not have a GPS antenna outside but the inside location works perfectly. We made sure to test the GPS signal strength before finishing the installation and were prepared to modify the location if needed. Issue 1. If everyone has AIS, it's going to get too crowded, and the AIS alarms will go off continuously. We believe that people who experience alarms going off all the time aren't using their AIS capabilities properly. When inshore and in high traffic areas, there is little need to have alarms enabled for AIS. In most cases, you're watching the navigation system carefully and will have visual AIS warnings of approaching vessels. Most systems allow AIS targets to be removed from targeting as well. Only when you're offshore or in a non-crowded area should AIS alarms be turned on. Electronic navigation means using your electronics – you can't expect to set it once for all types of travel and forget about it. Issue 2. I don't want others to see who I am. We believe this is compromising your own safety. It is much safer to receive a VHF call with your boat's name rather than a lat/lon estimate. If you do feel a need for secrecy, most AIS devices have a switch that will turn off the transmission of your data. We didn't even install the switch on our AIS because we believe it's a bad idea to turn off data transmission. Issue 3. Ships just turn off AIS-B traffic so having a transponder is worthless. First, we don't believe it is true that ships can turn off AIS-B traffic. We'd love to know from ship pilots out there and we'll get the info out. In our experience, every ship we've called said they could see our boat on AIS and our name on their displays. That's good enough for us. But we'll keep asking. There are many other capabilities possible and coming with AIS. There are already inexpensive wearable AIS transmitters for crew. Fall overboard and the person in distress becomes an AIS target on all chartplotters in the area. Virtual buoys are being experimented with by the Coast Guard. If there's shoaling or a missing buoy in the future, it's likely to be a radio signal with a lat/lon that will show up at the proper position on your AIS display. ActiveCaptain August 18th, 2012| No comments - be the first!|Tags: activecaptain - AIS.